Garden beds covered with mulch blankets all tend to look the same, and my cats (and the dog) understand this. They see me pick up the camera and immediately know I'll struggle for subject matter. I obviously need cat models, not to mention cat company! 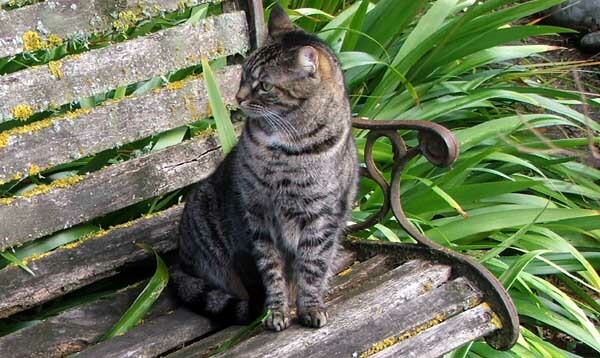 We'll walk past a garden seat, and a cat will leap upon it and pose, without even being asked. Garden seats can lead sad, solitary lives in winter - unvisited, abandoned in the gloom. Ah - I remember sitting here, dozily dreaming, in the height of summer... But this is winter, and I have photography work to do. 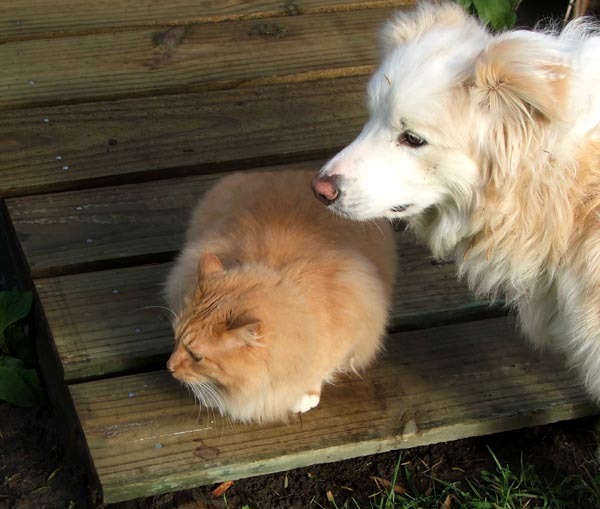 My cat models, sleek Histeria and the giant Fluff-Fluff, are getting restless. Quickly now - is this my best side? Click! Quite a few of the original fence posts have been left in place in my garden, and I've tried to camouflage many with shrub and flax plantings. 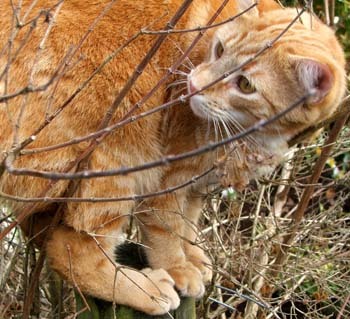 Trust a cat to find every single one, and balance cleverly on top! Show off! Histeria the tabby likes X-Treme Cat Climbing, up to the top of the tallest gum tree, then out along the bendiest branches. I can hardly bear to look up, let alone take a picture. Cats in trees tend to lack the concentration (but hopefully not the balance) to hold a decent pose, anyway. But I do peep to check that Histeria gets down safely - she normally uses the descending spiral technique, back legs first. Too scary! 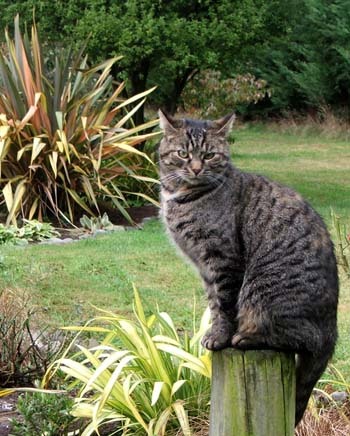 And she will happily climb smaller things, like Cordylines and fence-posts. Phew! I've spent hours creating proper paths in my garden borders, and it's gratifying to see all my cats using them - though often they'll walk on the edging stones rather than in the muddy middle. This is consumer testing of the highest quality, and certainly livens up all my winter path photographs! The same goes for bridges, though Fluff-Fluff the flying fur-ball will sometimes take shortcuts, leaping in a high parabola across the water race. Unfortunately I've never successfully caught his big-air leap on camera. 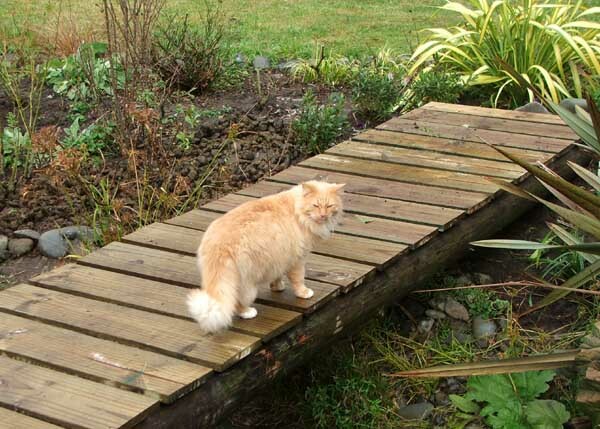 I have other pictures of cats (and the dog) walking this way and that on every bridge at Mooseys. 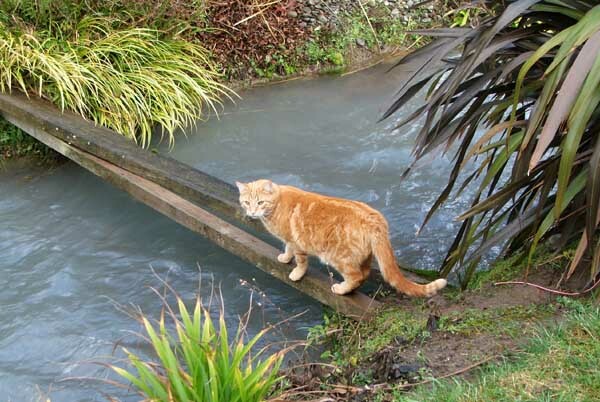 But I never captured that moment when Rusty the dog skidded on icy Middle Bridge one winter's morning and fell head-first into the cold water. Pity! Yes - I mustn't forget the value my dog potentially adds to my winter snapshots. Although he only has two looks - goofy or adoring - and lacks the ability to provide any other facial expression, he will at least stay still, in one place, for ages and ages. This allows the photographer (me) to compose the shot, get interesting angles on the garden features, and focus perfectly. Now which of you cats has the co-operative skill to do that? I hope you enjoy my Winter Moosey Cats (and Dog) in the Garden image series. 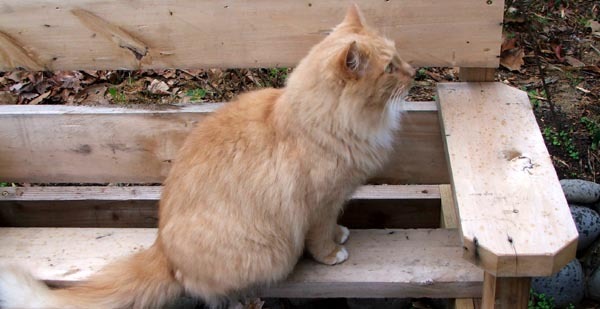 Thanks to volunteer cat models Percy the ginger, Fluff-Fluff the fluffy, and Histeria the tabby. And Rusty the dog.